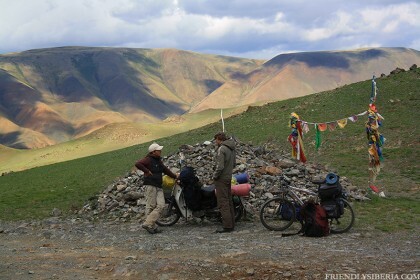 Moto travel across Tyva through Buguzun pass. 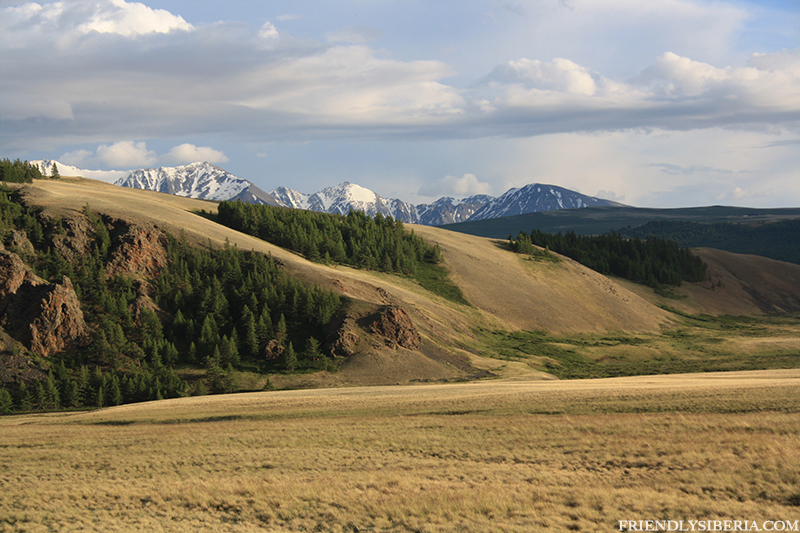 When we planned our trip from Novosibirsk to Altai through Tuva and Khakassia, we thought only how to visit as more beautiful places as possible. 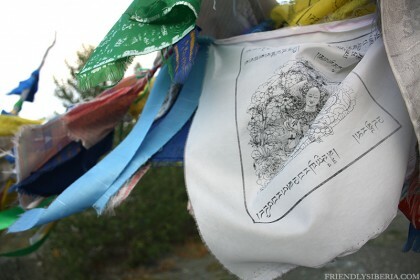 We did not expect that we will experience another country without crossing the Russian border: another religion, another language, another ethnic group – in Tuva everything was new, and we were so inspired: what’s new after the next turn? 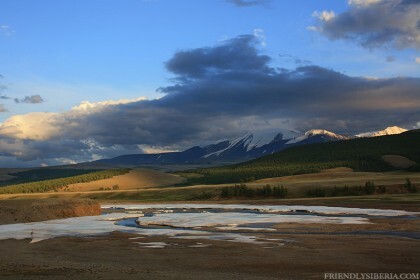 Anyway, meeting with Tuva began from real fear. 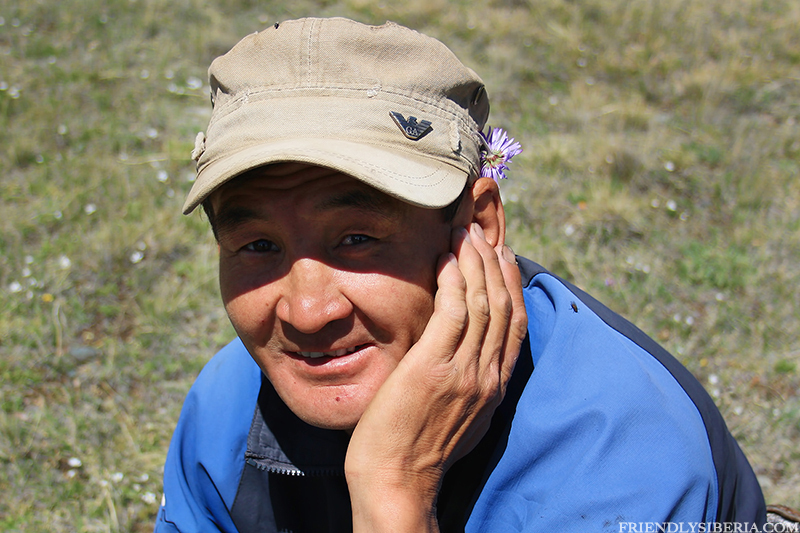 Every person we met in Khakassia told us that Tuva people are wild and severe, and they can rob us and moreover – when they are drunk they can even kill. We had to believe. We have not heard any good word about Tuvans. Absolutely. Traffic police stopped us after the border Tuva-Khakassia. Inspector asked us just two questions. 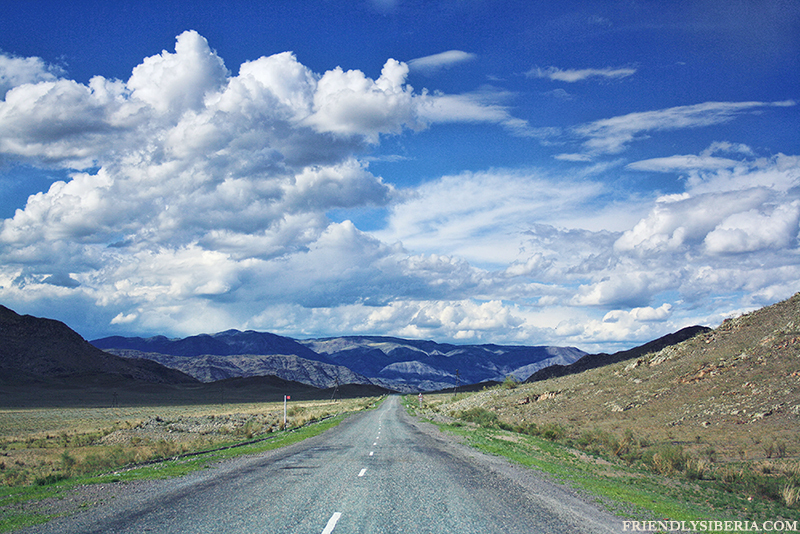 – What about a road to Altay? – Road is a totally pizdets! – Inspector looked at us as we were sentenced to death. He was not surprised of our way of traveling: one motobike for two persons and bicycle hitched by tow. 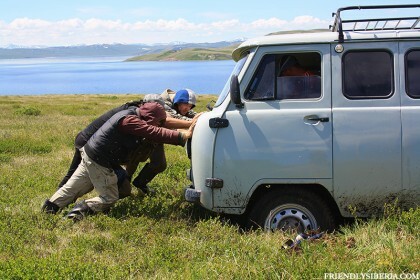 Here in Tuva people think that safety on the road is a private matter. During the trip, we met minibuses several times, packed with people on the roof, drivers, drinking vodka at the wheel and shuttle bus without registration. A place for first night we chose very carefully: so that was not there any yurts or pastures. It was getting dark, we thought that our camp hidden under the trees was almost imperceptible. We started make a fire when we heard the crunch of fallen leaves. Guest came to us. More precisely: the owner. We were guests. – Give me some tea! – the stranger told us. – We have no tea yet. We making a fire. Tuvan began to gather branches for a fire in full silence, and then always silently he broke our stove of stones and made to his preference. – It would be better, give me the pot. We did not argue and give him a pot. The stranger lived in a yurt on the other side of the river, and came to us in search of lost cow. 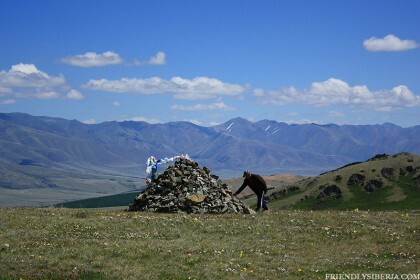 However, we did not believe in the history of lost cow , and then we became convinced that every Tuvan shepherd knows “his” territory better than we know the contents of our apartments. For Tuvinians all that is on their land it is their property, and we are strangers. No matter what we all have Russian passports. They are ancient nomads, they are masters of this land, and we are foreigners and uninvited guests. “Our” shepherd lay down near the fire to a pile of dry leaves and willingly answer the questions. He live in the yurt all the year: in the summer near the river, and in the winter, when the river freezes, it is transported to the hot spring. When the herd is completely deplete the pasture, he transport the yurt to another place. This occurs once every several years. 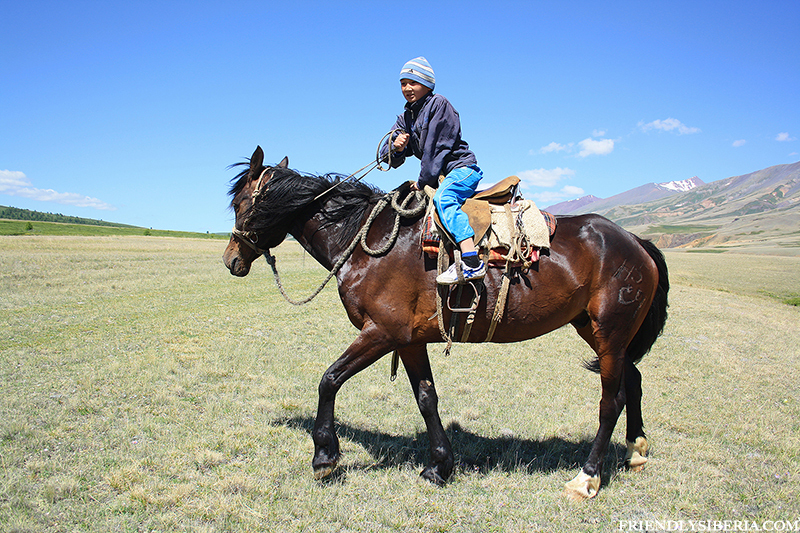 No shops nearby, so he have to go by horse to Ak-Dovurak, small town in 60 km. – We are poor – complains our interlocutor. – And how many cows you have? – Cows? Ohhh … a lot … I don’t know. We have also horses, sheeps, yaks, – the last word he utters gently – they are beautiful, good wool, we make carpets from it, – he add. Who are the poorest: the manager who have a mortgage to apartment or a Tuvan shepherd who have open roof house – anything where he can galloped on his horse. Before he go away , he asked us for tea and bread. We are not offended and added to this “present” a sausage. We understood that he did not want to extort nothing, he just saw what he need and ask that. How he could. Without reverence and European etiquette. I’m sure that if we will need, for example, his coat, we could say, “Give coat, we really need it.” And he would give. The next day we were again stopped by traffic police. 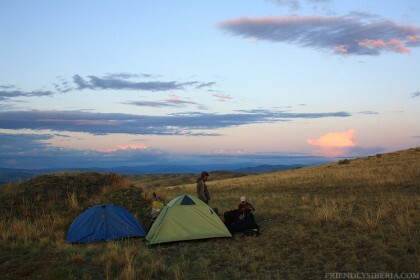 They were surprised, how we can go to southern Tuva without guns and hunting knives. – And what is there? 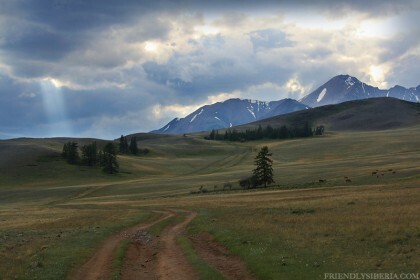 – There’s a wild place there is only a yurt and horsemen with guns. Last year, American tourists was robbed. Of course we was worried of riders with guns but when we see incredible mountain landscapes we forget everything. For a while. 20 km before Chadan our bicyclist punctured tire, we just start to remove it, as car with three drunken locals stopped immediately. They began to help us glue the tire. After the introduction, they offered us vodka. Local peoples drink a lot , we saw on roadsides hundreds of empty bottles. Our new friends had already thoroughly “fill the tank” and went on the road. We asked where do they work and what they do but they did not answer, saying only that they ride across the region. The conversation with them was long and complicated, two of Tuvans asked us to give him a motorbike for few minutes, and when we refused he get angry. At the beginning of our conversation near us stopped a car with russian man. He looked like the thriller’s hero: bald, stern, with a gold chain around his thick neck. – All right? – He snapped, and it became clear that otherwise on this case he have a flamethrower and a pair of grenades. Tuvinians silenced. – Yes, all is ok! – we would not like scenes with Schwarzenegger. 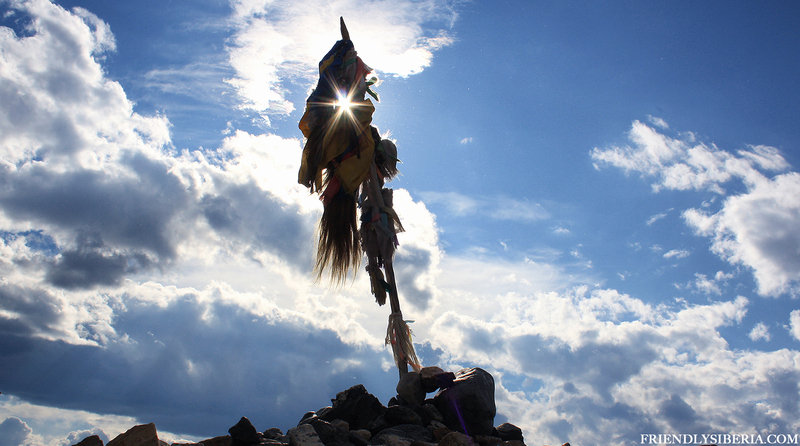 Third in the company of our new friends was a shaman. He hardly spoke Russian, was calmer and older than others. From a conversation with Shet (his name), I realized that shamanic gift is inherited. Several times he asked me if I knew of Genghis Khan and at the same time pointed to the sky. 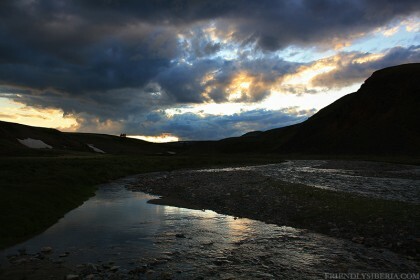 I realized that for him Genghis Khan is a kind of God or nature’s Spirit. 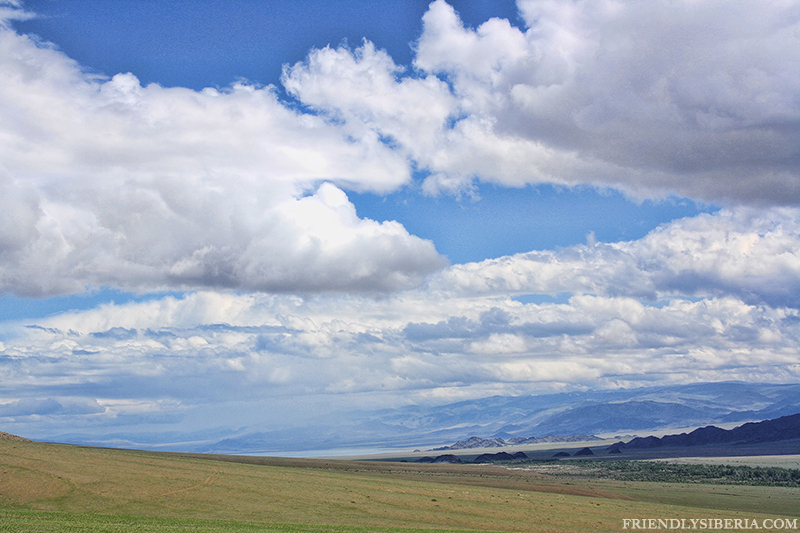 – Genghis Khan are everywhere – said Shet and draw a half-circle in the sky. Then, to my surprise, he licked my hand, closed his eyes and I saw under his eyelids eyeballs rotating rapidly. – What is this? – I felt very uncomfortable, and wiped my hand on pants. – I see your life – Shet’s face changed, it became introspective, sad. After few moments he turned his face. At this time, I believe that he is a shaman. After finishing a bottle of vodka, they left, and we went to look for a place to sleep. That night we slept on top of the pass. Bottles piled up everywhere here. We did not see any garbage besides of bottles. Tuvinians do not litter at home. And bottles? Well, it’s a gift to the spirits of the mountains, they want to relax sometimes too. The next day we filled gasoline tank and a canister in Chadan and we went to the most hard and wild section of the path. 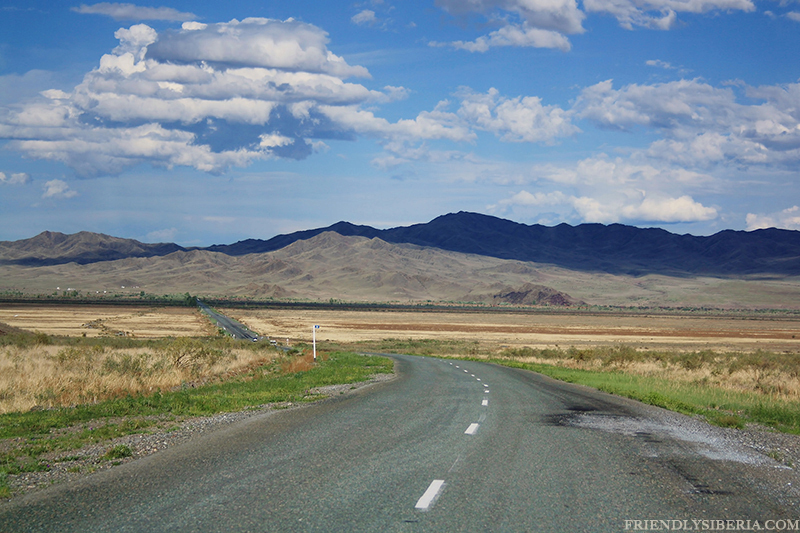 Asphalt ended after the turn to Mugur-Aksy. 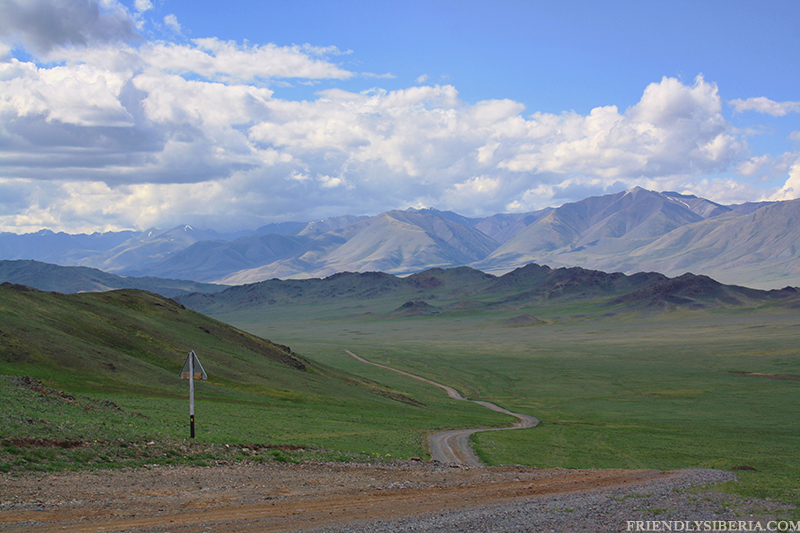 The main road went straight to the border with Mongolia Khandagaity village. 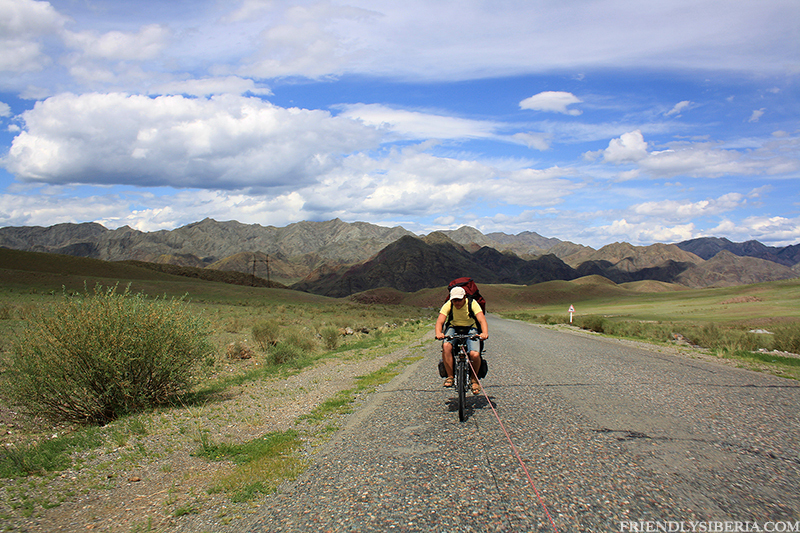 Our bicyclist said: if there is a hell, this is the eternal road to Mugur-Aksy. 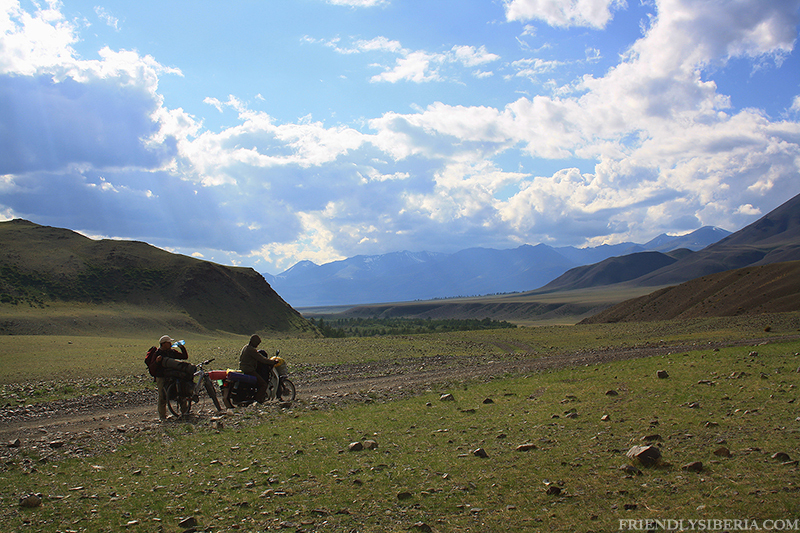 We ”crawled’ 120 km on this road for two days in some areas, the road was like a dry riverbed. Bad road made us forget about the horsemen with guns. 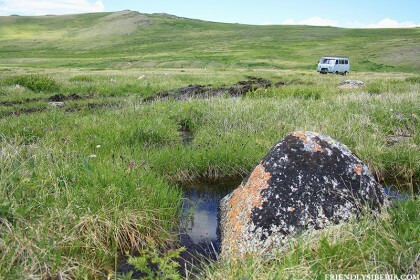 We did not stop in Mugur-Aksy, because we want to get to the lake Hindiktighol this day, it was only 60 kilometers to the lake, but on the dirt roads, paved with natural boulders. 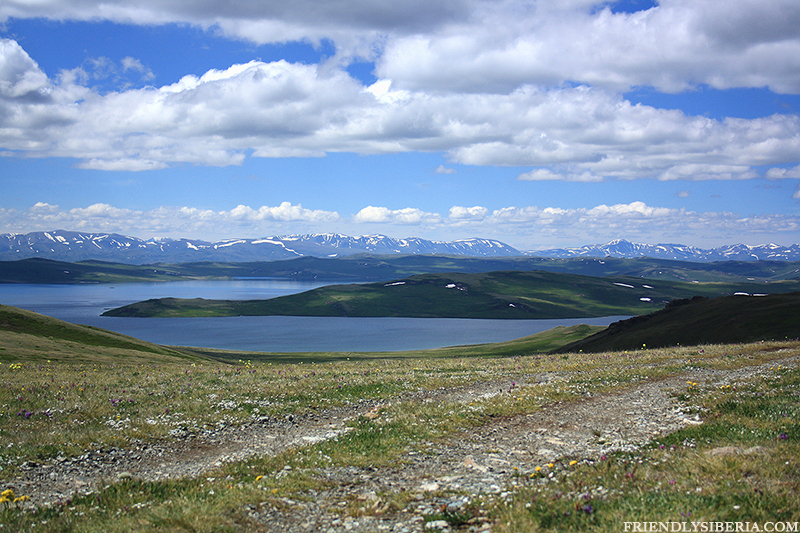 We stopped to spend the night on the back of the hill before reaching the lake 15 km. Below the hill, we saw a yurt and we were hoping that no one will come to visit us. And no one came. In the morning we have gone further, but realized that we are lost. Besides the motobike does not start. We must to ask for help of three shepherds what we saw last night, they had a big car and they would take us back to Mugur-Aksy. In this yurt lived a family, they greet us very warm and invite to come inside, where we drink traditional tea with milk and salt. 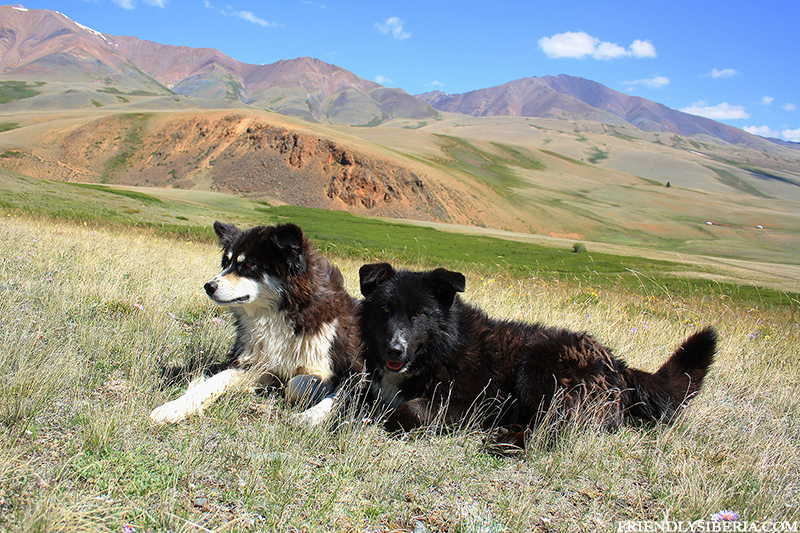 They agreed to pick up us in Mugur-Aksy tomorrow. The head of the family called Tchoban, it means “shepherd”, he said that last night we stay on their pastures and at night the wolves came. He drove them away before dawn. In the morning in the car for 8 people fit 15 people and our motobike, bicycle and backpacks. Besides us and Tchoban with his wife in the car were the elderly and children from the neighboring yurt. In Mugur-Aksy we stay at night in the hotel and Tchoban advised to not go outside, in the morning we had to find a car that will bring us through the Buguzun pass. 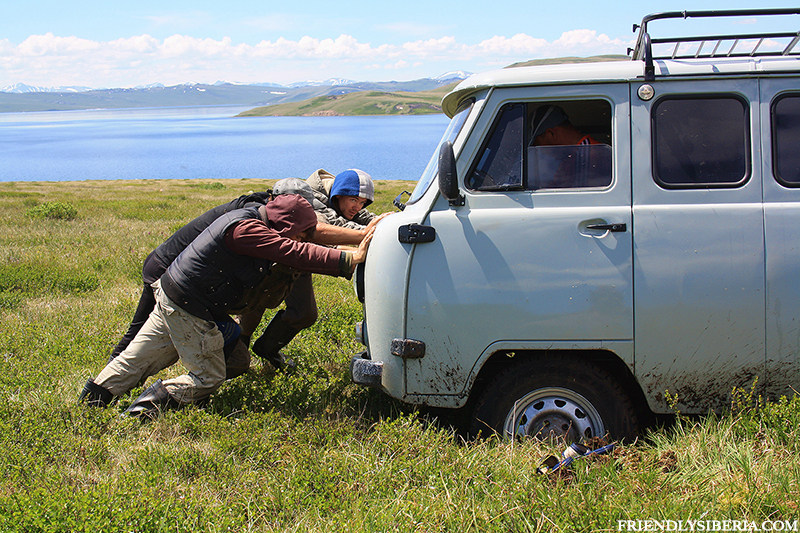 In the morning we found a vehicle that took us for 120 km to the Altai. The road along the lake Hindiktig Khol consisted of marches. In the first kilometers the car stuck in the mud. We moved throws short distance from tussock to tussock. Then began the long climb up the hill. During the road we were talking to the conductor. His name was Buyan, he was the youngest in the company and he plan to study in Novosibirsk’s university. The tuvans know the history of the republic very well, however, their history are not so much intensive and has slight changes. They continue to graze their herds and live in yurts. The civilization in this region came only in the form of equipment: now they use solar panels in the yurts, have mobile phones under a picture of mountain sheep and put amulets on the car’s mirror, not on the favorite horse. In Kosh-Agach we were at night and we felt immediately the atmosphere of another world: more civilized, not so much mystery. Altai has become a popular tourist destination like Baikal lake and many other places. 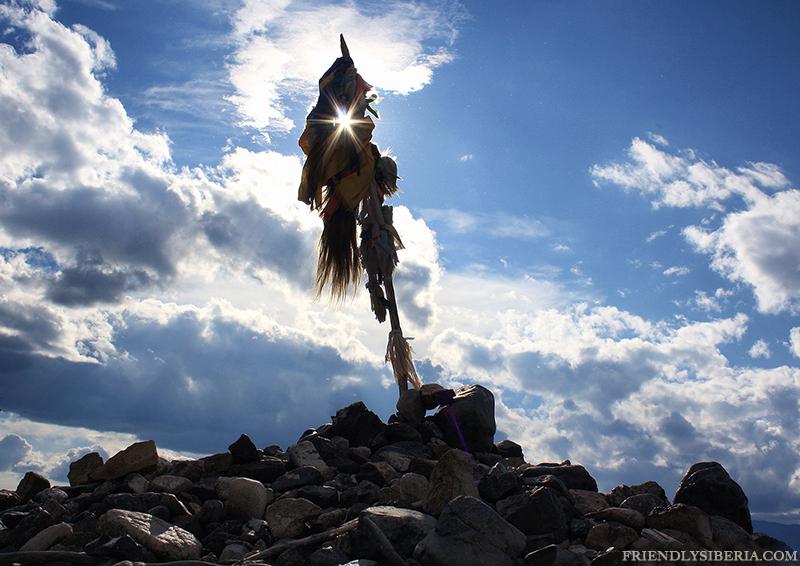 Only Tuva is still strange and wild. Maybe because of Tuvans who observe traditions and ready to kill anyone who would encroach on the sacredness of their earth? Amazing crazy travel and story! PreviousTravel to Russia, Siberia. 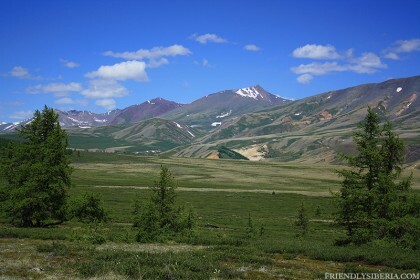 Jeep tour to Khakassia.